This week i managed a day off and a trip to a favourite river that was at a reasonable level. First cast and i got this nice mid-double then lost a smaller fish. Then i managed to lose 2 20lb plus fish at the net; the second of which looked an upper 20. Devastated doesn't come close after the weather and conditions this season. Then as i was sitting on the bank reliving the losses i received a call from my local hospital to inform me my father had been admitted poorly. It put the loss of the fish in perspective and i packed up after just half a day and made the 3 hour drive home. My dad is doing ok i am glad to say. The pike can wait. A Great Cause; give generously! Most of you know about this tragic event Baz Fisher's life. If you don't follow the link above. In the memory of Jodi & Ella Baz is doing this auction; his 3rd auction in their memory. Please support Baz and help him raise a fortune for this great cause. If you have spare angling stuff to donate contact baz on facebook or just bid generously at the auction. At the start of this 2013/14 I was invited by an old fishing partner and good all-round angler Andy Dixon to meet a good friend of his Darren Bostock who owns the excellent carp bait business Carpbait-Solutions based in Wrexham who make some of the most succesful boilies in carp fishing in the UK. Darren has 30 years experience in the bait and food industry and is very innovative. Darren had been getting reports from his customers that they were catching pike on their fishbased boilies and in particulartheir innovative Halo boilies. An idea was born from this feedback and then together discussed ideas on flavours sizes etc. Quickly Darren created the 1st prorotpes and i went out and field-tested them with instant results. Why use a foam pop-up when you can use one of these little beauties that is safer to the fish because its food and its packed with flavour the pike adore and leaks enticing colours? Darren has come up with a superb product that is catching me lots of fish. CBS have decided to call the product The Deadlift ; a great little catchy name for a superb product. This product will get you more fish and give you that vital edge we are constantly looking for. 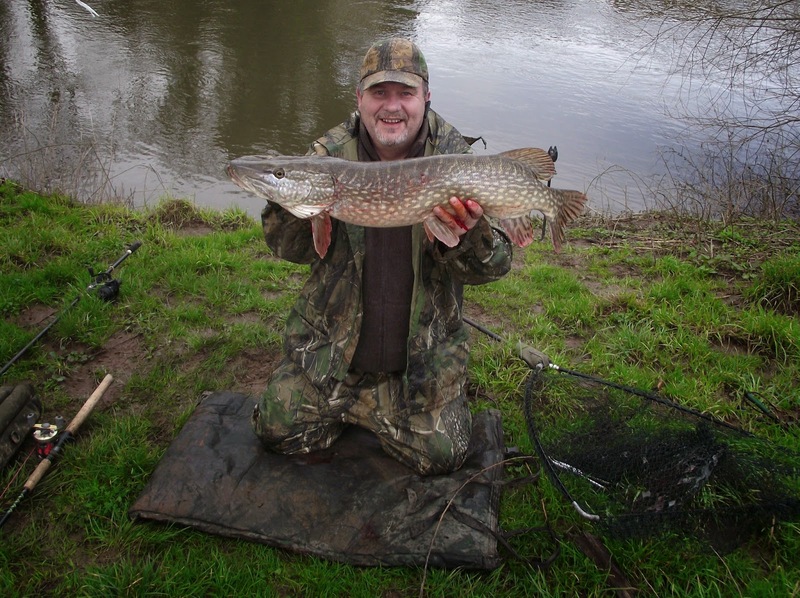 There's waters we all have wanted to fish that are either private or syndicated and thankfully one of these waters my friend Neil 'Noddy' Whitehead happens to be a syndicate member and is allowed to take guests. So after dismissing the flooded rivers we chose his water for a days fishing. We chose a superb day; one of the very few this year so far and we managed a few fish. I have to say the fish in this water fight like demons. Even though my local rivers have been out of commission for over 2 months there is still the ht river around the country that have offered short spells of fish-able conditions; windows of opportunity. One advantafge of being self-employed is the ability to drop everything at times to pursue Esox when windows of opportunity arise. Here are some photos of 3 trips in the last 2 months when 2 friends and i took advantage of the conditions. My good friend Paul Gratton moved 18 months ago to The Orkney Isles and has made a new life for himself and his lovely family Jackie and kathryn. They are very happy there and have quickly settled into Island life. Having seen the photos of the Orkneys Paul has shared with me i can clearly see the attraction. There is only one thing wrong with the Orkneys as far as Paul is concerned; There's NO Pike. ﻿ He is a fanatic Pike angler and does miss it. So his piking has been reduced to his odd visit home during the year back home to see family. On this occasion it was early December, so we took advantage and got out for 3 days. The weather wasn't in our favour but it was still fishable and i think we enjoyed the last ofthe decent dryish weather for december and into 2014. We have the knickname of the 'Tornado Twins' when we fish together becaue we seem to have this knack of picking the worse days of the year to fish; and our first day on the bank was no exception. Above are photos from a bank day where the winds forced the tide higher than recorded in decades. The final outing of Paul's trip we decided sensibly on still water and went to a private lake i know and although we only caught jacks we had a super day catching up in a beautiful location. In early December before the rain really starting coming down i had the geat pleasure of spending the day with a Piker who is fast becoming a legend in this sport; Nathan Edgell. Nathan was doing a whistle stop tour of PAC regions starting in Lincoln, stopping in lancashire(RA31) and finishing his talk/slideshow tour in Cambridgeshire. Clocking up one hell of a lot of miles to support the PAC and share his experiences of the last 9 years stalking Esox Lucius in the rivers of the Southwest of England. It was my responsibility and pleasure to take Nathan out for the day and try and get him his first Northern Pike.. the day before he had blanked on the Trent sadly sothe pressure was on slightly to see him land one. He arrived early at mine and i already had the boat hooked up and breakfast sandwiches made so off we went. We lost an early fish but conditions looked good. We trolled livebaits and lures and cast a few lures during a fun day. We shared stories and made friends which is what this sport of ours and the PAC offers. I thoroughly enjoyed his company. I've met a few well known anglerwho i haven't liked but this guy is a genuine fella. His approach to piking for those of you who have been to one of his talks is quite unique and it has paid off for him. The rewards have been well earned; he has put in the hours and walked many a mile for his pike. Some of his fish are breathtaking and inspirational. His sense of humour is widely known now from his infamous facebook postings but healso has gift for the written word which in the future will be there for everyone to appreciate. Nathan's roadtrip might have contributed to his failing health this day. As the day progressed he got sick. Suffering from a sore throat and feeling pretty awful he wasn't at all sure he couold give his talk at Region31 in the evening and even worried about Cambridge thefollowing day. On the way back to my house he loaded up with half the products in the Pharmacy in my village and proceeded to give a shortened version of his talk with the members of 31 huddled around so he didn't have to shout. He could barely speak but struggled through and delivered a fascinating talk and slideshow which was well received by the packed room. The photos of his captures truly amazed the pikers present including myself. We did get that first Northern Pike and i made a new friend. Here are some of the photos from the day. I am completely obsessed with Esox Lucius and have run this small predator group for 9 years now with the help of Steve 'Gulper' Lewis. I fish with like minded Pike fanatics and between us we have landed some superb fish; many over 30lbs but we have enjoyed lots of fun along the way.